The WGL Silver Series is the second highest level for competitive play in World of Tanks. Leading directly into the professional world that is the Gold Series, the Silver Series is full of hidden gems, and the best place to catch a glimpse of future talents and superstars in the making. The new season will start on 17 January. The matches will be played each Tuesday, Wednesday and Thursday at 20:00 CET. The season will last 12 weeks, and end on 6 April. All the teams in Silver receive special accounts, with all tanks and crew skills unlocked, so they can play to their full potential. 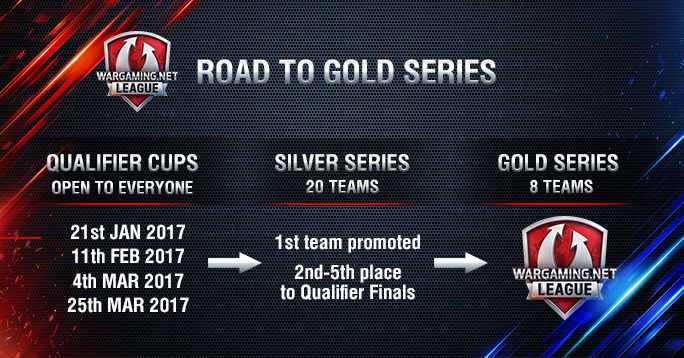 At the end of the Season, the winner of the Silver Series is directly promoted to Gold for the following Season. The teams ranked 2nd to 5th enter the Qualifier tournament against the relegated teams from the Gold Series, to determine who deserves a spot at the higher level. The complete rules to the competition are available on ESL play.